When you want the best fireproof filing available, look to FireKing for a two hour UL Rating. Double the fire safe protection of other brand names, this four (4) drawer vertical file cabinet is designed to hold letter size documents. 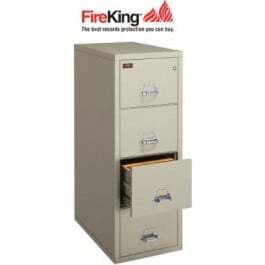 The best fireproof rating for a filing cabinet is the UL 2 hour rated from FireKing, this vertical cabinet is UL Fire, Impact and explosion rated and features an ETL Rating for computer media and external hard drives.